I have been using OpenScad for roughly a year now. It’s been a great experience, and I’ve learned a lot about the program, and the limitations of my own design skills. 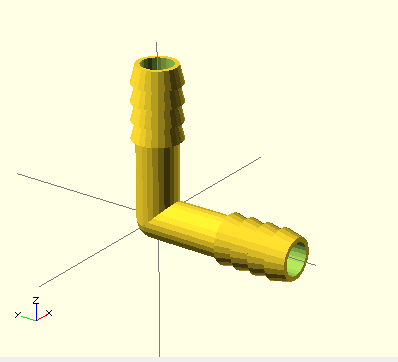 I have written a lot about using OpenScad, and where its strengths and limitations are, at least relative to my own design skills. I recently asked a question on the OpenScad mailing list: Does anyone know of an effort to write a book on OpenScad? The response thus far has been ‘the wiki book is THE book’. 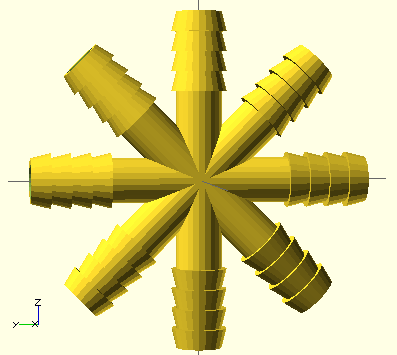 So, I am contemplating the following, as I have before: Is there room/desire for a printed book on how to use OpenScad? I had asked this question some time back in a different forum, and the recommendation at that time was “go ahead and start writing chapters, and put them on your blog”. This is what I will start doing. 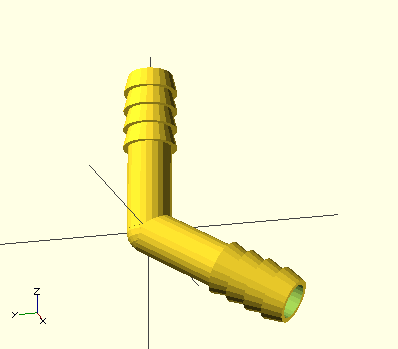 I believe there is room for some structured walk throughs of some nuances of OpenScad. 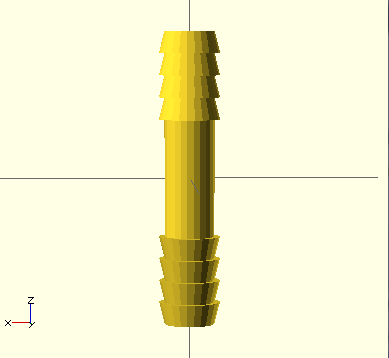 I will put some form around my various OpenScad musings and put them up here. My intention is to not just cover what can already be found in the user’s manual, but taking a modeler’s approach. Basically, show a picture of a thing, then deconstruct how that thing can be created with OpenScad, showing interesting techniques, and explaining various OpenScad functions along the way. Similar to some of the screen casts and other tutorials I’ve seen, but probably getting into deeper detail. And it will show up with a pretty background, and line numbers. That’s quite an incentive to improve my WordPress skills. After creating the first quad connector, I thought about how I could improve upon the design. The design is pretty straight forward. I want to support some slats of corrugated plastic panel that are arranged in a torsion box fashion. That just means the pieces interlock with each other with notches cut into them to accomodate the overlap. The support piece simply has slots within which the slats can slide and be supported. For the base of the connector, I didn’t want to simply make it square, because I don’t think that is the optimal shape for saving on plastic. 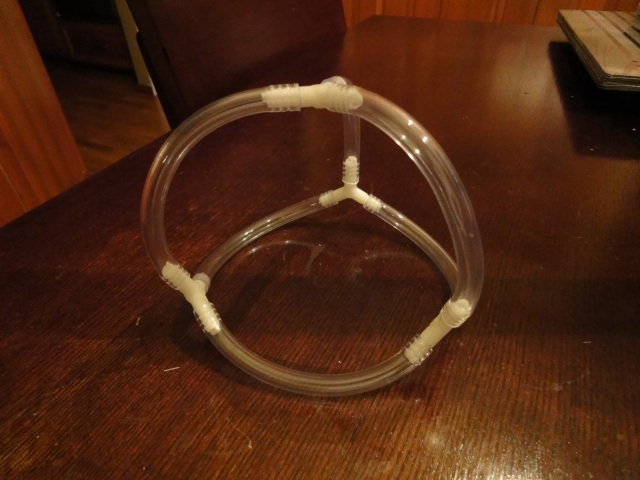 So, in the first design, I reduced the amount of plastic by cutting out the corners with a cylinder. This design works well enough. As you can specify the length and depth of the supporting walls, it’s fairly straightforward to specify exactly how much support you want out of the piece. There are two sides to a circle though. 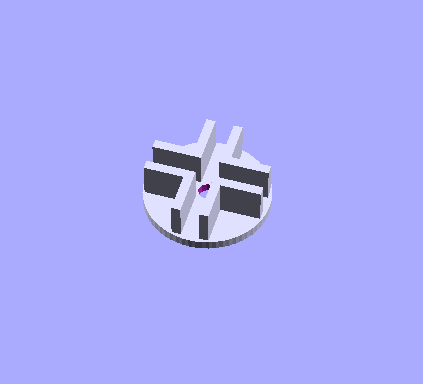 I decided to try it the other way, by making the connector base circular. This one has the advantage that it does not have the sharp edges on the base like the previous one does. It still has sharp edges on the supports though. I think this one is more aesthetically pleasing, and easier to “understand”. It’s just a round cap that goes over some joined pieces of material. As this is as much a study in how to use OpenScad as it is about creating an actually useable piece, the OpenScad code has been updated in the github library. This last parameter determines the style of the connector. It can be either ‘CIRCULAR’ or ‘CUTOUT’. The default style is ‘CIRCULAR’. Just to pull it altogether, I created a more complete image of the torsion box. 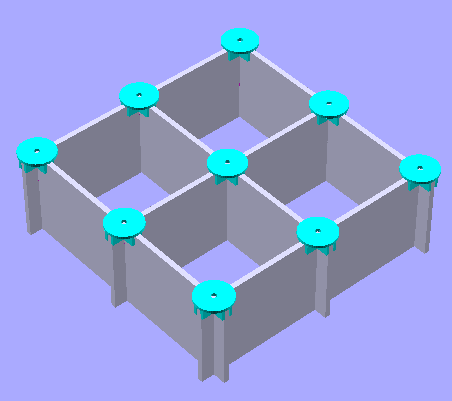 This shows a more completely, if fairly minimal, torsion box, with circular connectors installed on all of the vertices. The torsion box can be of any size, and utilize any appropriate material. My original intent was to use the corrugated plastic panel. As I have not as yet tried, I don’t really know how well it will work. I tend to think the connectors will actually face down to the ground, leaving a totally flat surface on the top to support flat flooring panels. The code found in connector.scad is fairly straightforward, with an emphasis on modularity. I could have coded this up in a single routine, but instead I broke it down into constituent parts so the design could be easily modified, altered, and improved. 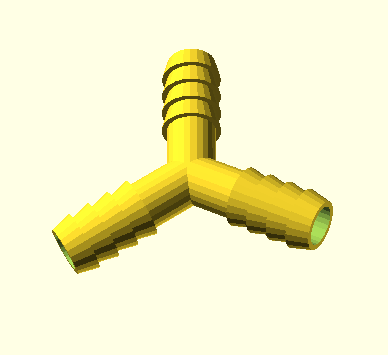 If you’re into studying OpenScad code, this might be a good one to look at for a simple object. Up until recently, I was living in a very large house, that was out in the Suburbs. The house was too big, and the neighborhood too lonely, so we’ve decided to move to a high rise apartment in the city. Before making the move, I wanted to do one last thing on Thingiverse before packing up the computers. Recently, I was reading some posts on the OpenScad mail alias, and someone mentioned lighting. That got me to thinking, ‘why can’t I deal with my own lighting in OpenScad?’ Well, for one reason or another, it’s just not possible. OpenScad does not really expose any of the rendering pipeline to the script interface, so all you can do is your basic CSG modeling, as the renderer is just a part of the display system. One of the common aspects of any rendering pipeline is doing things with “textures”, which is nothing more than a fancy term for a picture. In classic 3D rendering, the texture object is used to give some life and, well, texture to objects displayed in a scene. Textures are most typically like decals. You just paste them onto the surface of what you’re viewing. 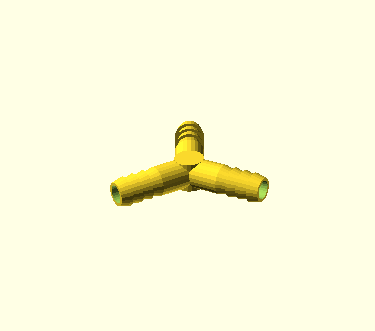 OpenScad has no native ability to do much with images within the CSG environment, so I had to start from the ground up. values – an array that contains the color values representing the image. There should be width*height*cpe numbers in the array. I would get the representation of a 2×2 checkerboard pattern. That’s a great thing, but does not quite represent an ability to do texture mapping. Note that the color values have been normalized. That is, take the raw picture data value, and divide it by ‘maxvalue’ and you get numbers between [0..1]. This is what OpenScad can deal with, so it makes sense to just do it from the beginning. That’s nice. Now you have a little picture where the ‘pixels’ are each 1mm in size, and each pixel in the image matches one of the little cubes. But wait, we don’t want there to be a direct connection between the number of pixels in the image and the size of our object. Also, I don’t want to have to know the actual size of the image. I want to be able to write routines in such a way that I can assume a single size for all images, and magic will just happen. Therefore we need ‘normalized’ pixel locations, which will be the subject of the next post. Last time around, I introduced the very simplest concepts related to geodesic math, namely the spherical coordinates. Now, let’s go one step further and utilize these spherical coordinates to do some calculations. Here, I will reference the book: Geodesic Math and How TO Use IT by Hugh Kenner. Although this book was originally written in the 70s, I found it to be the most descriptive when it comes to exploring the details of creating geodesic structures. First of all, in order to form a geodesic structure, you can start by choosing a platonic solid. For the purposes of the geodesics I’ll be dealing with, I use the Octahedron, and the Icosahedron. One of the curious aspects of a platonic solid is that all of its vertices touch the circumscribed sphere of that solid. That is the sphere the exactly fits the outside of all the points on the solid. Given this funny nature, it is relatively easy to imagine extending various other points of the solid to meet the sphere. Why bother? Because each of the points extended in such a way represents another vertex, and when you’re actually building a geodesic dome, each vertex is a connection point for a stick or ‘strut’. 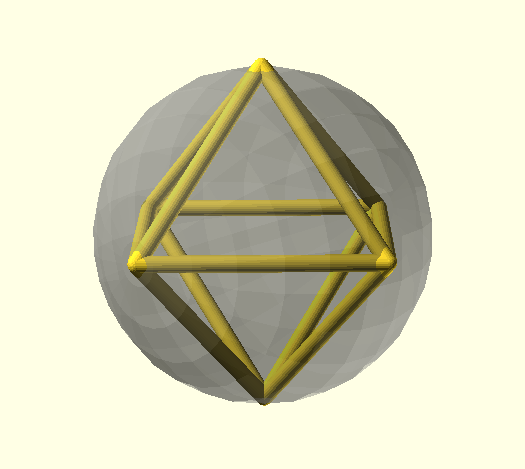 In the picture, we have an octahedron with its center at [0,0,0] of the cartesian coordinate system. Using this technique, and using the sph_to_cart(), and sph_from_cart() functions, you can easily go between the two systems. This is good because OpenScad knows about how to draw things based on cartesian coordinates, not on spherical coordinates. The next step involves picking those intermediate points on the face of a platonic solid, and projecting them out to the circumscribed sphere. As it involves a picture to demonstrate the technique, I’ll save it for the next post. With this code, you can play around with the various solids, display in wireframe, take a look at duals of the forms and the like. It’s all good preparation for the next round.